For you AMC detectives I'm seeking photos, articles, leads on two-seat AMX's with primary interest in the '70 model if such an animal existed in SCCA, FIA, IMSA or gymkhana events. Next best would be '68 and '69 and any '68 or '69 that was converted to either the '70 sheet metal and/or front suspension. I appreciate your help in advance. Not a '70 model but Ike Knupp (center, below) had a very competitive AMX that he raced in the B/Production class in SCCA road races. One of the most famous. Thank you. In reading about the rules in place during the era it appears that cars could be updated or even backdated to represent a given production year. Here is an AMX on the east coast that is currently under restoration. In 1975 when I graduated High School I bought a 70 AMX. it was a 390 4 speed a/c car. None of the people knew how to mod an AMC so i called up AMC located in Elmsford, NY ask asked for some info. I was bounced around and finally got on with a guy named Frank Lipare. Frank was a Senior Management type. He told me the he and a fellow AMC manager scooped the car off the assembly line in 1970 and transformed it into an SCCA car. A lot of the work to the body was done at a boat shop in Long island, the fiberglass front and rear flares. The motor was done by the famous Jocko Maggicomo and Speedwin Automotive , Long island. the car raced at Bridgehampton and Lime Rock. It was raced until 1974 when it became illegal due to the cubic inch restriction. they decided not to destroke it so it was parked until like 1975 when Frank began to club race it, again on Bridgehapton Long Island and Lime Rock Conn. Frank did hel me with technical infor and parts. I first saw the car at his home in Manhassett, Long Island in 1976 or so. I even went a few times with him to Lime Rock and Bridgehampton to help out on track day. 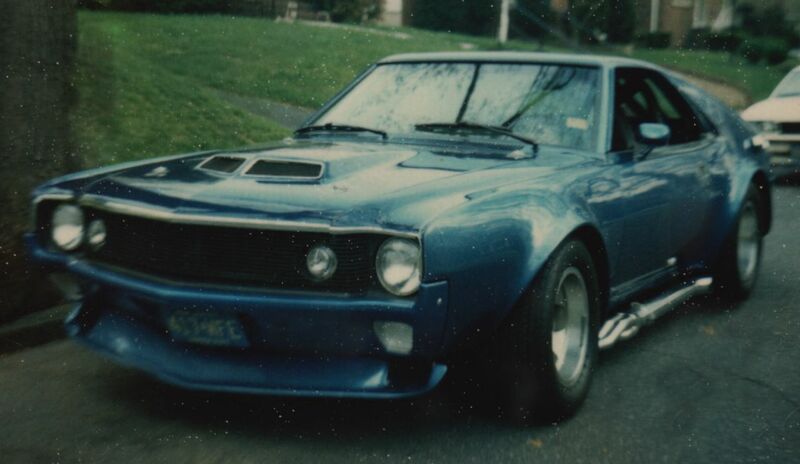 I bought the car in 1981 and street raced it in NJ almost exactly how it was set up for road racing. Smoked a lot of people. Sold it in 1985 and got it back in 2002 where it has been sitting since.. Frank passed away in 1988 and so did the document history of this car. I will completely go through it and bring it back to the almost exact condition it was when raced with a few modern upgrades.. It has a 390, Venolia 11.5 to 1 pistons, Ported 291 heads, cross ram, Reed roller can T-10 4 speed,4 wheel discs, ATL fuel cell. This one in particular is what got me motivated to find any other "'70" AMX's that would have raced in SCCA, FIA, regional club, autocross, whatever. I put '70 in quotation marks because if the AMX looks like a '70 or is really unusual in specification ( such as a converted '69, or an AMX with unique racing modifications[ blister hoods, flared wheel arches, individual induction or with cross-ram - but not an SS/AMX- and so on] ) that's really what I'm after. Though I'm an avid follower of all things T/A, and Javelins, in particular, my personal leaning is toward the AMX. The '70 Donohue Javelin ( with the RWR yellow '71 Javelins in the personal favorite #2 spot ) is the ultimate T/A ride. The '70 AMX sheet metal is very similar. Is this what it looked like when it was raced? Looks cool. There was a 69 that ran Sebring, 1970, I think.....it was restored by Eisenberg's crew out west....pretty sure the car was at the last Monterey Historics. White with large blue sail panel....red wheels. I believe this is the one you are talking about. This AMX was for sale some years ago, It may be the first one posted?? It has a very interesting rear suspension. not just what your after, shadow but bob tucker ran a '68 or '69 AMX for bannerman motors from toronto in sedan events in the province of ontario in 1969. photos of this car are hard to find. I have a few shots of this car from the net, at mosport race track. it ran in pretty much stock body configuration. Mike, Bud Tucker works close by and I see him occasionally. An AMX was classed as a B production car - was not run as a sedan. His son Gary Grant runs "The Garage Blog". ran with 390's, for example, they would have run up in A Production or the equivalent GT IMSA classification, from what I understand of the various race classes. Yes? robert, thanks for the clarification on the class for the tucker AMX. the photos I found were from I think the garage blog. maybe bud tucker could get them posted here. interesting that the photo of the chitwood camaro posted on the '67 trans-am thread is from bob tucker ! no relation ?